I very rarely write a review for any company. However, I felt compelled to pass along this company's information. Their driver was highly accommodating, respectful and patient and they have a great customer service, luxury & New limousines, professional drivers, affordable rates. We will use this service forever. I highly recommend them to anyone who needs a taxi or limousine. 100% professional service! 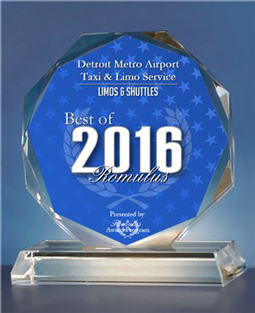 The most reliable service in Michigan, especially for detroit metro airports. On time always and clean cabs. I have been using them for long time. Very good service.